My first camera was an Exakta Varex IIa SLR with 3 prime lenses and a Weston hand held exposure meter. Over the 30+ years I had this camera, I was very happy with my shots, b&w, slide and negative, and my photograph methodology. When this camera began to give up the ghost, I moved to Nikons and owned 2 SLRs in the next 10 years. These had zoom lenses, automatic focus and exposure meters. It took me some time to adjust to the modern technology and I adapted my methods. I was quite happy to spend up to an hour setting up a shot of a mushroom, fiddling with reflectors etc. and most of my photos came out as I wanted. Then came the digital age and I’m racing through cameras – all Nikons – Coolpix 990, 4500, DSLR D70 and now D700 in the space of 6 years. In my ‘hayday’ I might have taken a roll+ of film a day – now I click away and have once taken over 1500 shots in the space of 2 hours! The whole way I approach photography has changed. No longer do I spend the hour taking the shot. Instead I rattle off the shots and then spend the time post-processing it! I now tend to believe the Camera’s exposure and only set the Aperture, or Speed, for the effect I require. If in doubt I happily fire away a bracket burst, as it costs nothing. I also take bracket shots to get the detail I require from contrast subjects, knowing that I can merge the images together to create the scene I visualised (I use a tripod for all ‘serious’ work). My ‘new’ camera has a failing in that it only allows +/- 1ev bracket steps and so I can wind up taking a lot of exposures (and using a lot of memory) for very contrast subjects. I do not have a simpatico relationship with the camera's metering and I feel I am just using it without understanding the limitations of this digital medium – both in the camera sensor and the computer display screen. As for getting the prints I require – that is a further complication. So I feel it is time I stopped, slowed down and get to grips with this medium. I need to experiment to learn – the following records my journey and what I learnt. 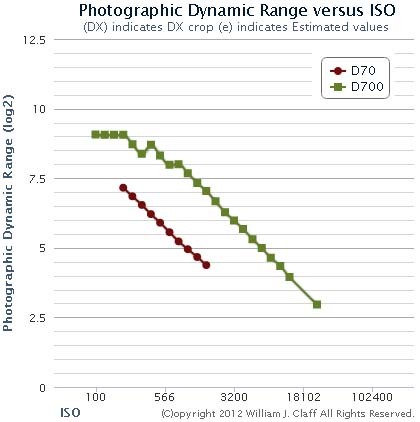 I can look at reviews, which say that the D700 range is 9.5 to 12ev depending on the contrast, or view a chart (opposite) which shows that the D700 is better than the D70. But that does not really tell me what is going on – so I need to see what is happening by creating an image of exposures. I limited the exposure range to that given by the camera bracketing, as I reckon the manufacturer knows how good the sensor is. I thought the way to check how the camera responds, is to create an 'Exposure Ruler'. So I took 9 +/-1ev bracket shots of an (out-of-focus) old grey card (using a tripod) - but any uniform subject will do. Sometimes I exposed as per meter and at others times to get the 0ev exposure around 50% Lab Luminosity. and so lastly I move into the Lab colour space and reduce the saturation to zero - this makes sure (I think) that the Luminosity does not change. Because of my lighting, and lens, the image was not entirely uniform and there can be a variation of 1% in the L values. 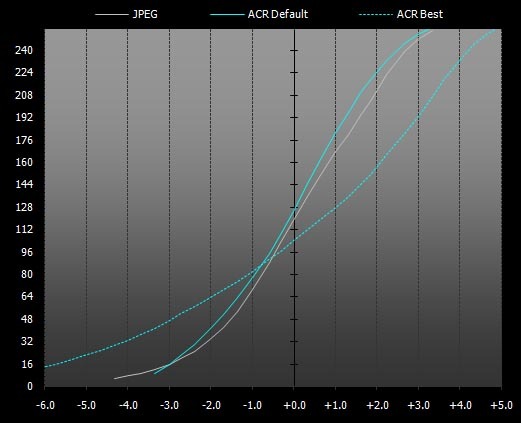 Note that middle grey is not the same for each camera and so this just gives a flavour for the cameras, but I think we can see that the sensors and camera processing has improved over the years! But where is this getting me? There are hundreds of combinations of settings on the camera which will change it's response. I thought I would home in on just a few for the D700. So the top end is not too bad, but the shadows are really compressed compared to the fixed 9 stop (real world) wedge. But I did a little more research, which you can skip! Opposite is my plot of the D700 set to Neutral processing (red) and then High Active D-Lighting setting (blue) - compared to the constant change (thin black line). What we can now see is that compared to a constant change in exposure tones, we have a classic 'S' curve applied to the image by the camera. The curve is quite steep which results in 'punchier' out-of-camera JPG image. Opposite is shown the result from a review of the camera and I'm pleased to see that I roughly agree with their jpg & default raw wedges and am amazed how much one can get from processed raw. The Dpreview test says "The best result we could achieve was 11.6 EV which is almost 5 (!) stops more than the default JPG output. It's no surprise then that in our real world tests we managed to recover highlights that had been hopelessly blown out". however the curves that correspond to these wedges show that the best raw must be a flat (non-contrast) image, as these curves demonstrate..